A really unique folk cane. A unique study of a face with minute glass eyes. 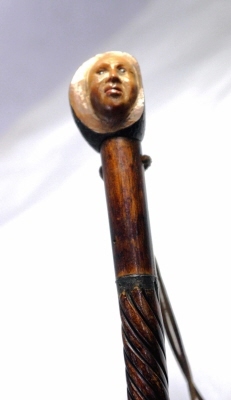 Carved out of what appears to be hardened resin in the background form of a coquilla nut.The study mounted on a turned hardwood shaft with original base metal ferrule. The cane holding a leather lanyard. Excellent condition free from breaks or cracks yet showing appropriate wear for age.